Lola, of Damn Yankees, is punished for her role in that fiasco by being turned into a car. Divine forces, who recognize that she was trying to do the right thing and eager to prevent a grave injustice, go exact words on that. Agent Coulson, in a shield facility, just happens to be around when a prototype Howard Stark hovercar seems to suddenly develop an AI. World of Warcraft: Poster child for why we need Eclipse Caste Solars. any WoW/Exalted crossover would need them, because hoo boy, does that place have too many Dawns. that crossover would work oddly well though, because Creation would be another pandaria to them and WoW would be autochthonia or a Wyld invasion to Creation and their themes of imperialism, war and power not being able to solve everything is actually something they share, because so many of Wow leader mistakes are Exalts thinking they're doing the right thing and only making everything worse as a result. y'know what would also be great? Harry Dresden crossing over with the Cosmere. Sure harry would just be one guy in a wider universe of political/divine plots and other heroes, but he already feels like that in his own books even if he is the focus, so its not a big of a leap. Just think of Harry having to both figure out cases in different time periods and culture but also take into account the different magic systems involved while using his magic creatively so that he doesn't break his own magical rules and kill a human because those still apply, and everyone in the Cosmere doesn't bat an eye at him explaining that his magic is different, because lots of magic in the Cosmere is different. They'd just come up with a Cosmere based explanation for why he can do what he can do until proven otherwise. The only ones who would look at him weirdly would be someone like Hoid who knows EXACTLY how many types of magic there is and how Harry definitely ISN'T one of them. This is entirely because I enjoyed Sun Tzu’s WIW of Gen 1 MLP, but who they REALLY need is Megan Williams, Savior of Worlds! In my worst fever dreams, I have a vision of the Joker getting hit by the Stone Cold Stunner. Well, SOME help. Imagine, instead, The Joker vs El Santo! -First one is a Doom 2016 crossover, that basically transplants the events of that game onto an Imperial research station, with the Doom Marine eventually joining forces with the Rebellion to keep the Empire from getting its hands on the secrets to acquiring Demonic power for their own. -Second one is a Transformers crossover, following the events of a modified Fall of Cybertron, with the Autobots and Decepticons reactivating after a battle between the Rebellion and the Empire. Eventually, this would lead to the Autobots joining the Rebels, although I doubt the Decepticons would have anything but a tentative alliance with the Empire, considering Megatron's disdain for organics. Of course, things would get complicated once you add in various Cybertronian artifacts like the All-Spark, which could turn any Star Wars vehicule into a Transformer, or even enhanced Droids into full-fledged, Spark-baring Cybertronians. Who, unlike ordinary Droids, can develop Force powers. And of course Unicron will possess the Death Star at some point. 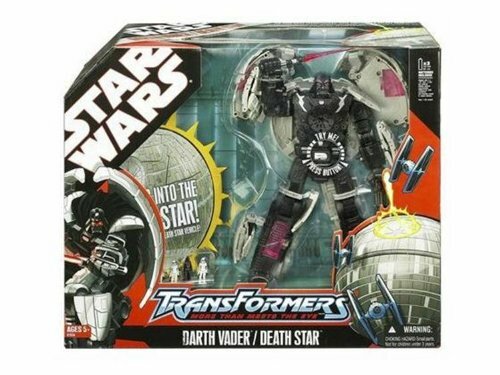 ISTR there was at one point a Unicron/Death Star Transformers model, but Google's failing me on it. Send help to Stone Cold so the Joker gets a mudhole stomped in him? Sure! Kinda middling at best as a toy. Transformation is fiddly and frustrating. I never managed to properly get it into Death Star mode. I gave it away a few years ago to a friend on seibertron.com. As for a SW/Transformers crossover? I wrote one a long time ago. it was a G1 hybrid cross with the NJO. Gotta admit, it was a bit... spitey. My loathing of the Vong was a not-small factor for it. I made Bluestreak, Thundercracker, and Optimus Prime Jedi in it. I also had Lusa, one of my favorite characters in the franchise, join the Decepticons and be all badass. Don't where else to put it, but a way of Getting Fing Fang Foom into the Marvel movies while giving a nod to the old Godzilla property. The characters riff on the cartoon's 'Thirty stories tall, breathing fire.." opening music and then FFF pops up. I think the world needs Guillermo del Toro to hook up with the new Godzilla movies for a Pacific Rim crossover. "We need... a 300-foot robot to fight the monsters!" "Great idea!" Or possibly a MechaGodzilla, so humans can get in the game of kaiju-fighting.